Every company wants to hire strong people, but I contend that most companies go out of their to way to hire people just like they’ve always hired. You can see this in the diagram below – the middle section of the curve represents the average level of people currently being hired. And here is a wake-up call: how many great people do you know who are actively looking, willing to take a lateral transfer, will negotiate their salaries before they know anything about the job, and are a perfect match on the skills and experiences listed on the job descriptions? I’ve been in this recruiting game for many years, and have met very few who fit this criteria. Regardless, companies continue to rely on this as their main recruiting approach in the hope that a few talented people will fall to them through the cracks. Worse, they spend a good portion of their process-improvement efforts trying to carry out this flawed approach more quickly, thus equating efficiency with progress. While all companies talk a good game about wanting to raise the overall level of their talent, it’s a difficult nut to crack since there’s just too much inertia and infrastructure in place to overcome the years of “we’ve always done it this way” kind of thinking. 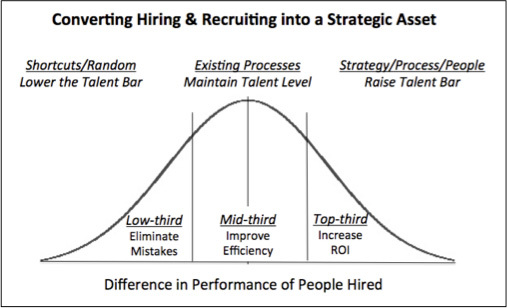 I refer to this dilemma as The Staffing Spiral of Doom – Catch-22. The link is to a video I prepared with LinkedIn, demonstrating that the transactional nature of the hiring process prevents companies from hiring stronger people. However, by rethinking the entire hiring process from nuts to soup, savvy talent leaders can convert their recruiting function into a strategic asset and competitive company advantage. Here are some ideas on how to get started and increase the long-term of your hires. The best people need to be proactively convinced to consider your opportunity. This requires compelling messages, opportunities for exploratory conversations, persistent recruiters and engaged hiring managers. 2. Benchmark top-third hiring practices. This starts by finding out how all of the best people in your company got their current jobs. You’ll discover the best were referred, promoted, hired through the university recruiting program or were found and recruited by a strong recruiter working closely with an engaged hiring manager. Most of these people were passive candidates, although a few will have responded to a job posting. Use this as a guide to reengineer your hiring processes. 3. Offer careers not jobs. Start by replacing traditional job descriptions with performance profiles. The top-third are looking for career moves, not lateral transfers. Traditional skills-infested generic descriptions are designed to weed out the weak. Performance-based job descriptions are designed to attract the best by describing what a person will do, learn and become. 4. Don’t use any type of internal job description for recruitment advertising. According to the #1 labor attorney in the U.S. – you don’t need to post boring descriptions nor describe every skill and competency desired. Here’s an example of how a job should be advertised. 5. Implement a 50/30/20 sourcing plan. The top-third in most companies have fewer years of experiences and skills than their peers, that’s what puts them in the top-third. During the 30-minute phone screen it’s important to look for evidence that the person has been assigned to more important teams and bigger projects, has received awards and recognition for exceptional performance, and/or has been promoted more rapidly. People in the top-third, whether active or passive, don’t view a job switch as a simple transaction. In order for both parties to make the right decision lots of information needs to be shared. This takes hours spread over multiple meetings. Too many recruiters try to rush it, compressing the whole process into a few minute box-checking discussion on the first call. 8. 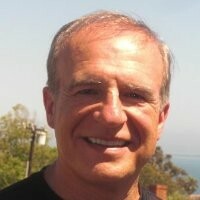 Measure hiring managers on the quality of the people they hire. If hiring top people is an important company objective it should be the #1 performance objective of every hiring manager and an essential part of their performance reviews. There’s certainly nothing wrong with avoiding hiring mistakes and being more efficient hiring people just like those who have always been hired. But if you want to raise the talent bar, you need to be different. Being different starts by benchmarking how the best people find new opportunities and compare competing opportunities. Implementing these best practices is hard work, but it’s how you convert recruiting into a strategic asset.